Thank you for contacting Nelson Homes. 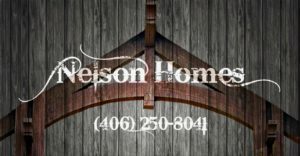 Contacting Nelson Homes about your building project is the first step towards making your new home or remodel a reality. During our conversation we will listen to your ideas, and make suggestions on how your project might come together. There is no cost to talk about your project, so lets get started. Thank you for taking on the task of creating our new office space in Ronan on such short notice and getting it completed in a timely manner. We appreciate all you did to make this happen! Copyright © 2018 Nelson Homes.